I am feeling less peaceful today. I was visiting the U.S. Consumer Product Safety Commission (CPSC) website today looking for some info about product testing requirements and exemptions for another crafter. 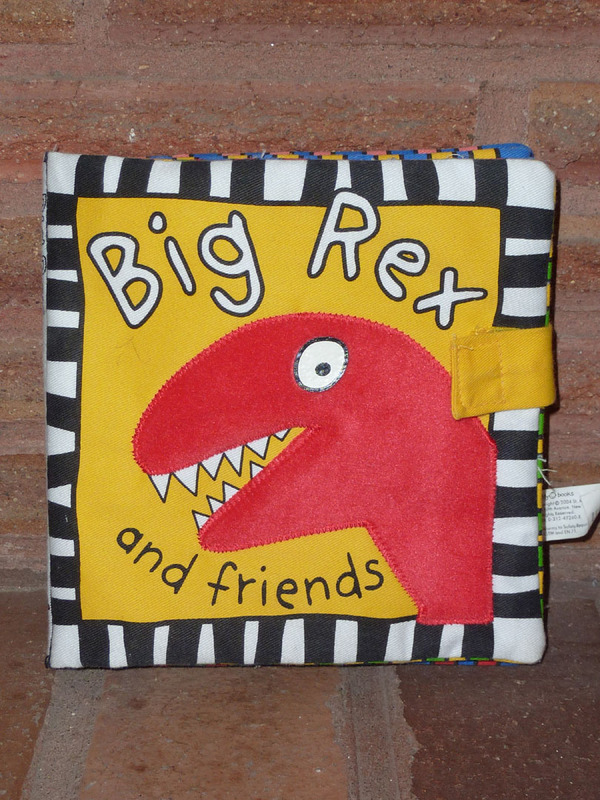 Right there on the main page was a picture of the cover of the Big Rex and friends book. It caught my eye because we own that book. We bought that book for Henrik. It was just recalled yesterday by the CPSC. This is the first item I have ever seen listed for recall that we actually own. 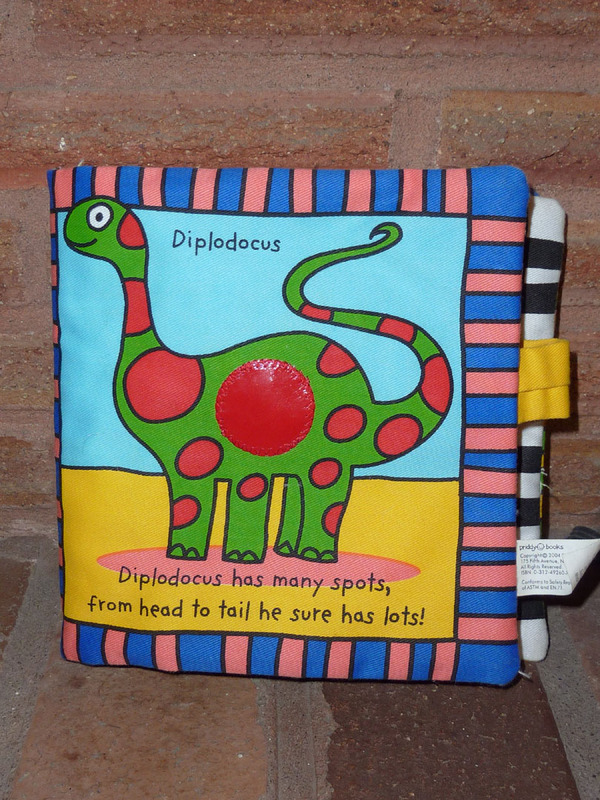 The recall stems from the excessive lead levels in the big red circle on diplodocus’ belly. Henrik was around a year old and we were living in Spokane when we bought this book at Auntie’s Bookstore. He was at that time devouring his board books and the pages of his Babybugs were becoming glued together with saliva. I saw this nice, fabric book on the display table and thought, “here is something safe for Henrik to chew and not destroy”. I had, of course, never bought a vinyl book because I knew to avoid PVC, phthalates, etc. I actually thought this through and decided that this was a good purchase. We read the book a lot and it got chewed on a lot. It was not made by an eco or green company, but $20+ cloth books weren’t in our budget. I had lashed up Henrik in the sling when he was less than a year old and walked to a fabric store and bought organic cotton flannel to make a fabric book for Henrik, but sleep deprivation intervened so many times that the yardage is still uncut. So, Big Rex entered the scene as a distant second place. It was made in China and that was already a compromise, but I did not think I was opting to compromise Henrik’s health. The label is printed with the words “Conforms to Safety Requirements of ASTM and EN 71”. How? Lead is not a new element. The proof of lead’s damaging effects on the nervous system, especially on children’s developing brains and nervous systems, is not new. This book should not have been available for retail sale for more than five years with such high lead levels. Here is the information about how to apply for a refund from the manufacturer. In addition to the CPSC failure to ban this book earlier, it looks like the U.S Environmental Protection Agency (EPA) is also lacking in their dispersal of information about the dangers of lead poisoning. Their web page about lead hazards does not even list toys as a source of lead exposure for children. Why not? I have a Master of Environmental Studies (MES) degree. I have studied environmental health and toxin exposure at the college level. I bought a toy that exposed my child to toxic lead levels. I missed this route of exposure and I am very well informed on this subject. It should not require multiple college degrees to protect our children from toxins. I would like to thank U.S.PIRG for testing this book and bringing the results to the CPSC. HealthStuff.org is also a great resource for toxins in toys and other items. If you are in a position to donate money, both of these groups’ work warrant your financial support. We tested the drinking water and dust in our house for lead in the last year. Both came back negative. Henrik also had his blood lead tested at his 3rd and 4th year well child visits. He is also lead free. I am relieved that Big Rex got packed away and forgotten about during one of our moves more than two years. Children should have access to safe toys that do not expose them to toxins and parents should be able to afford these toys. Toy manufacturers should carry the burden of verifying that their toys are free from toxins. It is unacceptable for the public to carry this burden. The U.S. should follow the model used in the EU and implement the Precautionary Principle so that toy manufacturers are held responsible for creating toxin free toys. This entry was posted in BPA, Environmental Health, Phathalates, Precautionary Principle, Read, TESC, Toxins. Bookmark the permalink. This entry was posted in BPA, Environmental Health, Phathalates, Precautionary Principle, Read, TESC, Toxins, Uncategorized. Bookmark the permalink.